Greg Matheis, Vice President and Commercial Loan Officer at Springs Valley Bank & Trust, was a recent graduate of the Graduate School of Banking at the University of Wisconsin in Madison. The Graduate School of Banking program provides a comprehensive course of studies directly related to the leadership, management and operation of a financial services organization in an environment of competitive, regulatory, and technological change. In combination with the Graduate School of Banking, the University of Wisconsin added the Executive Leadership Certificate to enhance the learning experience. The class of 2018 was the first to have the combined courses. 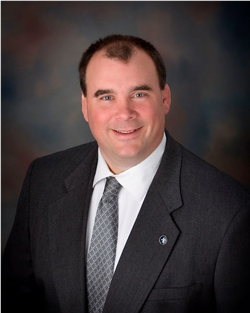 Mathies began his career with Springs Valley in February 2013 as a commercial loan officer. He works closely with commercial customers to review their financial needs, with a focus on growth. Craig Buse, Senior Executive Vice President & CLO for Springs Valley says Matheis has made a huge impact on the company and their client base. Buse added that it is just another example of the level of hard work and professionalism that he brings to the table. Mathies described the Graduate School of Banking a challenging, 25-month program that combined leadership and how to run a bank in this new age of technology. Due to significant accomplishments, he was named the recipient of the 2010 and 2011 Fifth Third President’s Award, among other awards. Matheis holds a Bachelor of Science in Accounting from the University of Indianapolis. He is also a past board member of Habitat for Humanity of Dubois County. Greg and his wife Connie are the parents of two daughters. Be the first to comment on "SPRINGS VALLEY VP GRADUATES FROM GRADUATE SCHOOL OF BANKING"